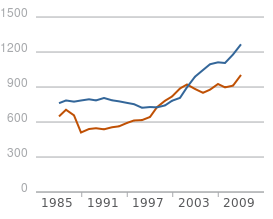 The blue line is total discretionary outlays of the federal government, and the brown line is the sum of tax expenditures. Both are in constant dollars. Note that these two categories of spending are about equal in magnitude. It is just as important to focus on stealth spending implemented through the tax code as on explicit spending. Addendum: David Leonhardt has a related article in the Times today. a measure of the government revenue losses resulting from provisions in the tax code that allow people or businesses to reduce their tax burden by taking certain deductions, exemptions, exclusions, preferential rates, deferrals or credits. By reducing the revenue that would otherwise have been collected by the government, tax expenditures are similar to government spending. “Tax expenditures” are not “similar to government spending,” nor are they a form of government spending, as “liberals” would have it. Taxes are governmental claims on economic output. If tax revenues from all sources amount to 20 percent of GDP, given the kinds of “loopholes” listed above, the effective tax rate is 20 percent of GDP. If loopholes are closed and tax revenues rise, government isn’t spending less money, it’s collecting more taxes. If loopholes are closed and, at the same time, nominal tax rates are reduced so that revenues remain constant, government isn’t spending less money, it’s simply redistributing the tax burden. All output is owned by government. Government “spends” (distributes) output through the provisions of the tax code. Such is left’s the upside-down, Alice-in-Wonderland worldview: Everything is owned by government, and citizens are mere supplicants. I am surprised by Mankiw’s apparent endorsement of this view. This entry was posted in Economics: Principles and Issues and tagged government spending, tax expenditures. Bookmark the permalink.